I have another quick card to share today. I have made a lot of birthday cards recently. Now I just need to get some in the mail! 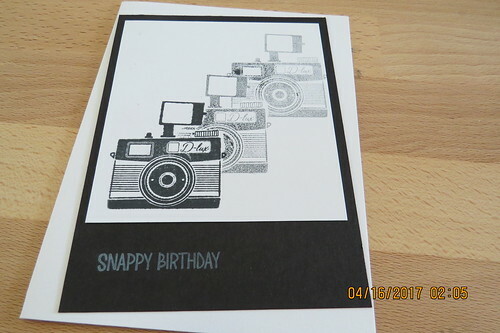 This time I used the Pun Intended set from Stampin Up. I stamped the camera image, masked, stamped off, masked, and stamped off two times to get the faded look. The "polaroid" is just the white piece I stamped on top of a longer black piece.